Augmented reality refers to any interaction between a real-life situation and virtual elements, including 3D and 2D images and geolocation. To make this interaction possible, you need a device that has a camera and an Internet connection. The bleed is the surface of a document that exceeds the dimensions of its finished size, which is used for printing but is later trimmed off. It is used when no blank border is desired. Must be at least ⅛ in. wide, although ¼ in. is ideal. What are the different types of colors (RGB, CMYK, PMS)? Color management is a delicate yet essential step in the graphics production line in order to remain true to the original look of your pieces. RGB primary colors (red, green, blue) are used for displaying colors on a computer screen. CMYK colors (cyan, magenta, yellow, black) are used in offset printing. The four colors of ink are printed one at a time to create process colors. Therefore, before your graphics files can be printed on our presses, the colors must be converted from RGB to CMYK. PMS colors can be used both onscreen and for printing, and enable a high level of color accuracy. The inks are mixed before printing to create specific colors. A basic fold involves the folding of a sheet into two equal parts, creating four pages. 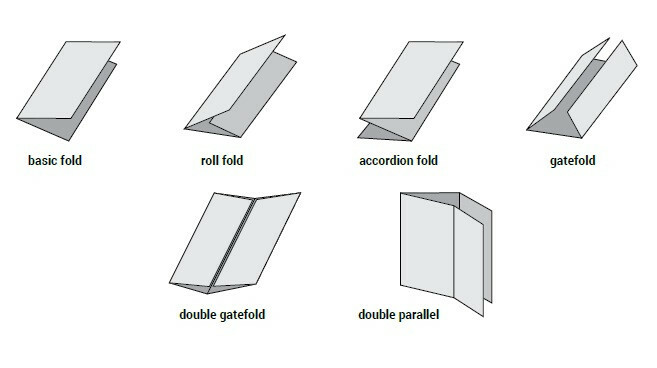 A roll fold is achieved by folding a document in three parts that fold back on each other, producing six pages. The inner section must be slightly narrower to allow the leaflet to close easily. An accordion fold is achieved by folding a sheet into pleats reminiscent of an accordion. A gatefold consists of three parts: two small parts on the sides, and a large one in the middle (when open). To unfold it, you pull open the two smaller parts as you would a gate. The double gatefold is similar to the single gatefold, but it has an additional fold that is parallel to the first two. The double parallel fold has three folds made with only two folding actions. It produces a document with eight panels. What are the different types of inserts? A blow-in is a loose insert that slides out as the pages are turned, making it hard to miss. It is often used for subscription cards, contest ballots and other documents that must be mailed in. A bind-in is bound to the spine of a publication. A magazine or catalogue will open naturally at pages that feature bind-ins, especially when the bound insert is printed on stiffer paper. This catches the reader’s attention immediately. A tip-on is an insert that is glued to a page. It can be easily removed and kept for future reference—ideal for multiple pages of content. Lamination is a process involving the application of a plastic sheet onto a printed document. The plastic may have a matte, glossy or satin finish to achieve different looks. Unlike a UV coating, lamination is only possible on full sheets. What should be known regarding the different types of paper? Offset paper is very versatile and generally offers a good quality-price ratio. It can be made of recycled fibres, as in the Enviro line. Coated paper is covered in a layer of mineral particles to improve print quality. This highquality support is available in glossy, satin or matte finishes.